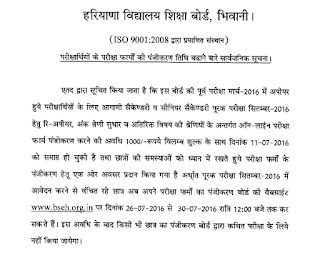 Board of School Education, Haryana (BSEH / HBSE) had released the notice regarding reappear forms for 10th / secondary and 12th / Higher secondary classes. Those students who were not able to pass March 2016 regular exams, can appear for these reappear exams to be held in September 2016. 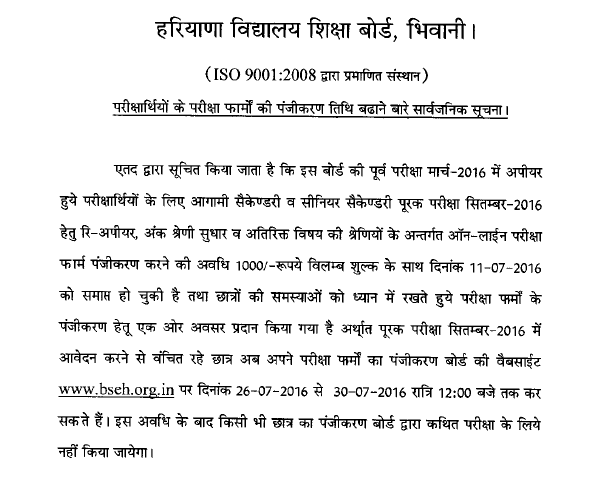 For that, they have to fill HBSE Reappear Application form for respective 10th / 12th class. Earlier the reappear forms are to be submitted up to 11 July 2016. Now the last date had been extended. Students can submit their online reappear forms from 26 to 30 July 2016 with a late fee of Rs. 1000. After this date, no chance will be given for registration. The reappear exams for both 12th and 10th classes will be held in September 2016.